SO lets start off with some of my favourite things in the kitchen!!! First we have our fantastic dark wood framed mirror! (sorry side picture.. I kept getting a glare from the window) We got this mirror at The Brick for $1!!!! Yes that is correct! It was originally a $350 mirror and it was on sale for a whooping $1! We couldn't refuse! The only thing that was wrong with it was it didn't have anything to hang it by (easy fix) AND it has a small scratch which we filled in with left over dark stain. Isn't it pretty??? Next favourite item of ours is our kitchen table set!!! I LOVE this table! It was formerly my Great Oma's (great grandma) table. It is a Duncan Phyfe table that extends out and can seat about 12 people around it!! I just love it because for everyday purposes it folds down into practically nothing and fits our kitchen perfectly!! (PS and for those wondering YES you can fit 12 people for dinner in our kitchen... you just can't open the fridge or move... haahaa) My uncle had this table for a long time and decided to get a new table so being the only family member who wanted it this table was given to us!!! YEAH!! Moving onto our next favourite... this is more of a funny favourite. For Ryan's birthday my brother and sister-in-law made him a switch plate that HAD to be hung in the kitchen. Now these switch plates typically sell for a lot!! BUT they made it themselves by painting a normal white switch plate! Isn't this the best thing ever!!!!! This is our Bombay clock (sorry picture if blurry... I didn't realize it when I took it) that we bought at a yard sale for about 10 cents! (it was fill a grocery bag of stuff for $2 ... this was in our grocery bag) The only thing wrong with it was that the piece at the bottom of the clock that spins was cracked off... nothing a little super glue wouldn't fix!!! Where to begin with my favourites in this photo... First we will start with the photo over the bed. That lovely photo was taken by Sarah Guy at Labour of Love as one of our engagement photos. Then for our wedding Sarah blew up the picture and had the matting put around it for our guests to sign. I LOVE the picture (sorry its slightly chopped off.. see the next picture below for the actual picture) ANYWAY I just love the picture!!! Next thing that I love is our bed!!! (now I may want to stain it dark brown in the future.. for now its fine the way it is) We got this beauty off of craigslist for $150. It is solid pine and I LOVE IT!!! Finally in the bedroom we have our fabulous quilt that my super cute Oma made for us as a wedding present. Its all hand done and gorgeous! NEXT is our spare bedroom/office.. Don't you just love the huge canvas that is on the wall!!! Once again this is a Labour of Love photo. This canvas was a wedding gift that we were given by someone. (aka HB ...thats for you Kelita.. haahaha) We had to get the canvas framed but I completely love it..don't Ryan and my butts look cute! HAHAHA!! And then we have the desk... I know its hard to see it.. but this puppy was going to be thrown into the garbage!!! I KNOW ITS A CRIME! At Ryan's previous job his boss was getting new office furniture and they were just going to throw this desk out (its SOLID wood.. they don't make them like they used to) so he asked if he could take it! His boss said if he could pick it up by the next day it was his.. so Ryan borrowed a friends truck and a few friends and went to pick it up along with the credenza that matches it (the credenza is used as our TV stand/games and DVD storage unit) This desk is gorgeous and I LOVE that it was FREE!!! #1 - I LOVE THESE SHOES! 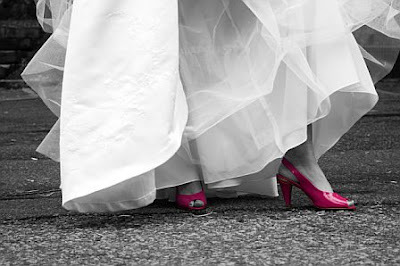 These were my wedding shoes (yes they are bright pink!!) I bought these from Winners for $29.99!! They are fabulous!! There are SOO many other things that I LOVE BUT not enough time to write about them! Have a GREAT long weekend!!! Hopefully I'll have some more project updates after the weekend! !